A sopapilla, or cachanga, is a fried pastry served in the Southwest United States, Mexico, Peru, Argentina, Chile and Uruguay. Traditionally, a sopapilla is made from light dough that puffs up to form a hollow pastry when fried. This pastry is served with an array of toppings for breakfast, lunch, dinner, dessert or a side dish. A sopapilla made from a tortilla is not common, but you can serve it just as you would a traditional sopapilla. You can make a sopapilla from a tortilla in less than 5 minutes. Top it with honey, powdered sugar, butter, lettuce, tomatoes, herbs or ground meat, for example. Place a deep skillet over medium-high heat, and add 2 inches of vegetable oil. Allow the vegetable oil to preheat for 5 minutes. Slide a flour tortilla into the hot oil, and allow it to fry for 60 seconds, or until it begins to turn a golden brown. Remove the tortilla from the oil with a pair of metal tongs, and place it onto a paper towel to drain. Repeat the frying process with as many tortillas as you would like. 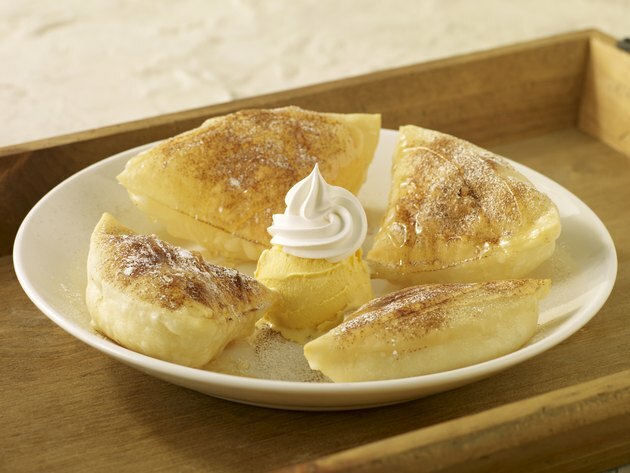 Serve your tortilla sopapillas while they are warm with your favorite toppings. Refrigerate leftover tortilla sopapillas, and consume them within 72 hours. Reheat the leftovers in a microwave. Use fresh, thick flour tortillas for best results.